New cutting edge technology can be used to grade cancer tumours, eradicating human subjectivity and ensuring patients get the right treatment. 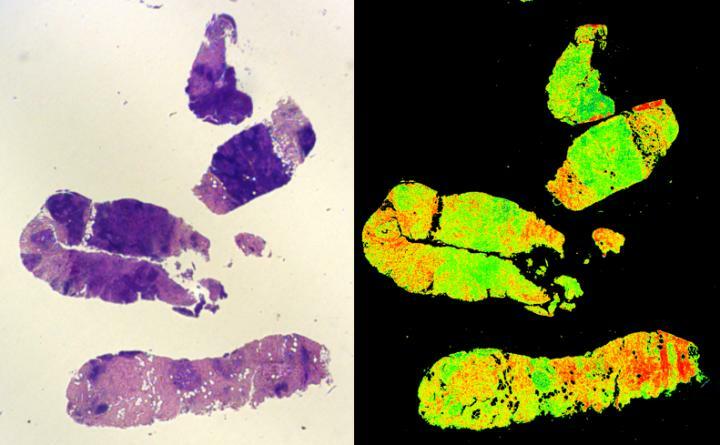 A new imaging technology to grade tumour biopsies has been developed by a team of scientists led by the Department of Physics and the Department of Surgery and Cancer at Imperial College London. Publishing their results today in the journal Convergent Science Physical Oncology, they describe how their new method promises to significantly reduce the subjectivity and variability in grading the severity of cancers. Nearly all cancers are still diagnosed by doctors taking a sample of the tumour, a so-called biopsy, then slicing it thinly and staining it with two vegetable dyes used for more than 100 years. They look at this 'H+E stained' sample under a microscope and then judge the severity of the disease by eye alone. Life-changing treatment decisions have to be based on this 'grading' process, yet it is well known that different practitioners given the same slice will only agree on its grade about 70% of the time, resulting in an overtreatment problem. The team's new 'Digistain 'technology addresses this problem by using invisible mid-infrared light to photograph the tissue slices in a way that maps out the chemical changes that signal the onset of cancer. In particular, they measure the 'nuclear-to-cytoplasmic-ratio' (NCR): a recognized biological marker for a wide range of cancers. Lead author Professor Chris Phillips, from the Department of Physics at Imperial, said: "Our machine gives a quantitative 'Digistain index' (DI) score, corresponding to the NCR, and this study shows that it is an extremely reliable indicator of the degree of progression of the disease. Because it is based on a physical measurement, rather than a human judgement, it promises to remove the element of chance in cancer diagnosis. " In the experiment reported today, the team carried out a double-blind clinical pilot trial using two adjacent slices taken from 75 breast cancer biopsies. The first slice was graded by clinicians as usual, using the standard H+E protocol. It was also used to identify the so-called 'region of interest' (RoI), i.e. the part of the slice containing the tumour. The team then used the Digistain imager to get a DI value averaged over the corresponding RoI on the other, unstained slice, and ran a statistical analysis on the results. Professor Phillips said: "Even with this modest number of samples, the correlation we saw between the DI score and the H+E grade would only happen by chance 1 time in 1400 trials. The strength of this correlation makes us extremely optimistic that Digistain will be able to eliminate subjectivity and variability in biopsy grading." The NCR factor that Digistain measures is known to be common to a wide range of cancers, as it occurs when the reproductive cell cycle gets disrupted in the tumour and cell nuclei get distorted with rogue DNA. It is likely that in the long run, Digistain could help with the diagnosis of all different types of cancer. At a practical level, the researchers say that the Digistain imaging technology can easily and cheaply be incorporated into existing hospital labs, and be used by their staff. Professor Philips added: "It's easy to prove its worth by checking it with the thousands of existing biopsy specimens that are already held in hospital archives. Together these facts will smooth the path into the clinic, and it could be saving lives in only a couple of years."